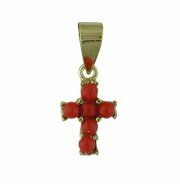 18Kt Yellow Gold simulated coral made from coral paste Cross Charm (11mm X 8mm / 18mm with Bail) by Amalia Children's Fine Jewelry at Blood of The Young. MPN: 6796. Hurry! Limited time offer. Offer valid only while supplies last.